Twice the previous model's input sampling speed. OMRON Electronics best-selling temperature controller, the E5CN, has been enhanced with extra features, which are available at no extra cost. The new series has twice the previous model's input sampling speed and supports both thermocouple/platinum resistance thermometer or analogue input types in different models. The improved model combines a new, larger and sharper, 11-segment alphanumeric digital display for easy to understand settings menus (no more menu code de-ciphering). The display also incorporates a 3-colour PV to provide green, red and orange characters. The colours can be programmed to visibly indicate an alarm from a distance, or when the PV varies beyond a pre-set deviation from the SV. The series also features an alarm delay timer, which prevents unnecessary alarms being triggered by allowing for process disturbances. Measuring 48mm x 48mm (1/16 DIN size) the E5CN is available in either panel mount format with an IP66 rating, or plug-in type with an IP50 rating. The controllers have the capability of traditional On/Off controls or advanced 2-PID control (with auto-tuning) to ensure very stable temperature control during start up and running. 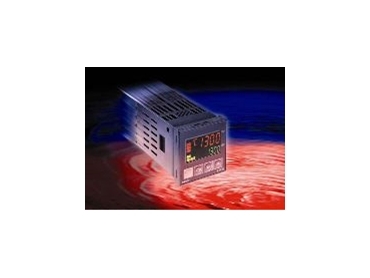 It includes a 3-phase heater monitor, which checks for failures in elements configured to a 3-phase supply. Another feature is the availability of standard or new, long-life output relays (electrical life of one million operations) with a capacity of up to 3 Amps @ 250V ac, and a choice of 100-240V ac or 24V ac/dc power requirement. The modular structure means it's easy to add communications, heater alarms, event inputs and extra outputs at a later stage. The E5CN's support both Modbus and Compoway/F protocols, which is software configurable. Omron's ThermoTools computer software is available for controller set-up, monitoring and data-logging. In addition it features password protection, to prevent unauthorised access to settings.